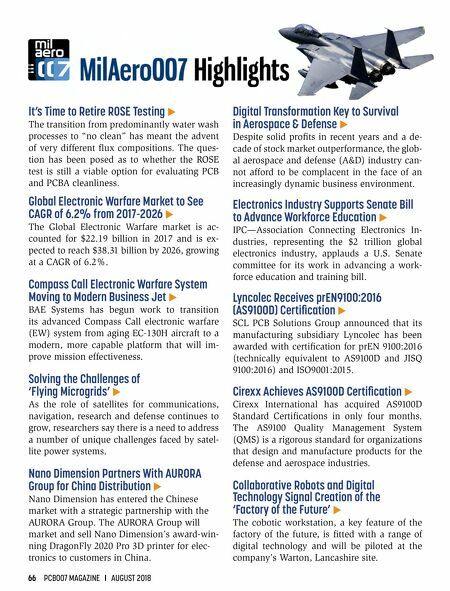 66 PCB007 MAGAZINE I AUGUST 2018 Digital Transformation Key to Survival in Aerospace & Defense E Despite solid profits in recent years and a de- cade of stock market outperformance, the glob- al aerospace and defense (A&D) industry can- not afford to be complacent in the face of an increasingly dynamic business environment. Electronics Industry Supports Senate Bill to Advance Workforce Education E IPC—Association Connecting Electronics In- dustries, representing the $2 trillion global electronics industry, applauds a U.S. Senate committee for its work in advancing a work- force education and training bill. Lyncolec Receives prEN9100:2016 (AS9100D) Certification E SCL PCB Solutions Group announced that its manufacturing subsidiary Lyncolec has been awarded with certification for prEN 9100:2016 (technically equivalent to AS9100D and JISQ 9100:2016) and ISO9001:2015. Cirexx Achieves AS9100D Certification E Cirexx International has acquired AS9100D Standard Certifications in only four months. The AS9100 Quality Management System (QMS) is a rigorous standard for organizations that design and manufacture products for the defense and aerospace industries. Collaborative Robots and Digital Technology Signal Creation of the 'Factory of the Future' E The cobotic workstation, a key feature of the factory of the future, is fitted with a range of digital technology and will be piloted at the company's Warton, Lancashire site. It's Time to Retire ROSE Testing E The transition from predominantly water wash processes to "no clean" has meant the advent of very different flux compositions. 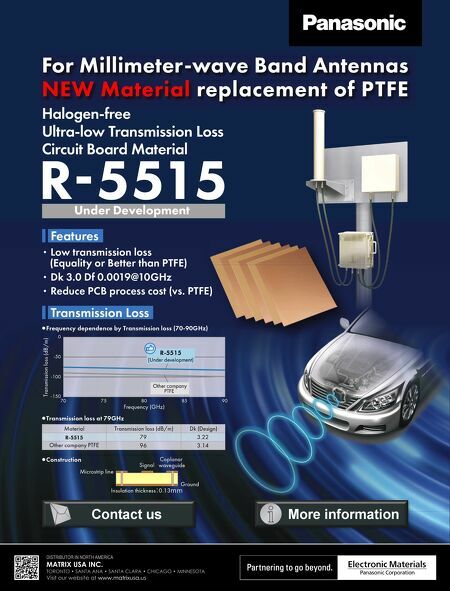 The ques- tion has been posed as to whether the ROSE test is still a viable option for evaluating PCB and PCBA cleanliness. Global Electronic Warfare Market to See CAGR of 6.2% from 2017-2026 E The Global Electronic Warfare market is ac- counted for $22.19 billion in 2017 and is ex- pected to reach $38.31 billion by 2026, growing at a CAGR of 6.2%. Compass Call Electronic Warfare System Moving to Modern Business Jet E BAE Systems has begun work to transition its advanced Compass Call electronic warfare (EW) system from aging EC-130H aircraft to a modern, more capable platform that will im- prove mission effectiveness. Solving the Challenges of 'Flying Microgrids' E As the role of satellites for communications, navigation, research and defense continues to grow, researchers say there is a need to address a number of unique challenges faced by satel- lite power systems. Nano Dimension Partners With AURORA Group for China Distribution E Nano Dimension has entered the Chinese market with a strategic partnership with the AURORA Group. The AURORA Group will market and sell Nano Dimension's award-win- ning DragonFly 2020 Pro 3D printer for elec- tronics to customers in China.